An automatic nail gun reduces the amount of time spent on completing woodworking projects. Installing molding, casing and trim goes smoothly until a problem develops with your nail gun. The Angle Finish Nailer, model number CHN70600 and manufactured by Campbell Hausfeld, stands out as one of the most popular nail delivering systems for general purpose work. Construction workers, carpenters and contractors have popularized this useful tool and have become familiar with its intricacies. The nail gun will fail to operate under specific conditions and being aware of them will help you troubleshoot your nail gun. Inspect the O-rings in the trigger housing. Dropping a nail gun often causes damage to these rings and damaged O-rings allow air to leak around the trigger valve. Replace the O-rings to stop a trigger valve air leak. Check to see if the nail gun’s bumper or O-ring seals have damage. This type of problem permits air to leak between the housing and nose. To remedy this, replace either the O-ring seals or the bumper. Tighten the housing screws to prohibit air from leaking between the housing and cap. Replace the housing gasket if the problem persists. Clean the drive channel and magazine. 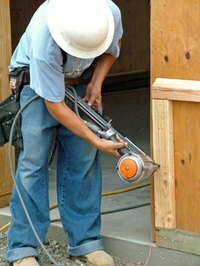 Dust, dirt and small particles of construction debris can foul the drive channel and magazine of the nail gun. To prevent the gun from skipping nails, keep these areas clean. Check the condition of the nail pusher spring. Replace bent, kinked or broken pusher springs to prevent the gun from skipping nails. Examine air hose and compressor fittings. Tighten loose fittings with an adjustable wrench. Inadequate air flow to the nail gun, due to loose fittings, causes the gun to skip nails. Evaluate the O-rings on the piston and check for wear. Replace the piston seals around worn O-rings. Replace the O-rings on the trigger valve if they show damage. Check for wear on the driver guide. Replace a worn guide to prevent nails from jamming the gun. Examine the nail supply. Only use the correct type of nail. Improperly sized nails result in bent nails that jam the gun. Check for damage to the nail driver. A nail driver that becomes fouled or damaged through excessive wear will cause the gun to jam. Replace it to prevent jamming.